Bollywood veteran actress Sharmila Tagore and Taimur Ali Khan’s grandmother opened about how she deals with her grandson’s ever-growing fan frenzy. She said she has realised the only way is to accept it. The two-year-old son of Saif Ali Khan and Kareena Kapoor Khan is the paparazzi's favorite and an internet sensation. His every move makes news and his pictures regularly go viral across all media platforms. On Sunday, interacting with Indo Asian News Service at HELLO! (Hall of Fame Awards 2019), the 74-year-old veteran actress said, "I suppose we have to live with it. This is the age of social media. I don't think anything can be done about it." The actress admitted to being old fashioned and that she is still learning to cope up with the media frenzy as it makes her apprehensive. She feels Taimur is too young for the constant media coverage. Tagore also revealed Sara Ali Khan’s (Taimur’s elder sister) advice to her and how it comes handy to her. “However, I learnt from Sara to say if you can’t beat them then, join them,” she told DNA. The Kashmir ki Kali actress received the Lifetime Achievement Award at HELLO! Hall of Fame Awards 2019. "I think it's a great honour. It's a recognition from very prestigious media house so, I am very honored. 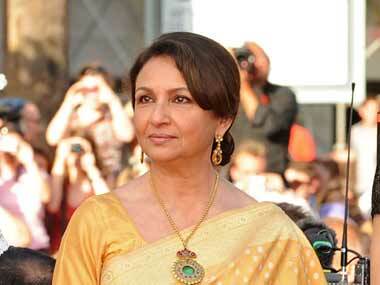 I suppose they are giving me award for working many years in this wonderful film industry," she told Hindustan Times. She has worked in many successful Bollywood films like Kasmir ki Kali, Amar Prem and Chupke Chupke among others. On being asked her most memorable moment in her film career, she said there are not one but many and she cannot pinpoint one as all of her films are like her children to her.